After featuring an awesome, Mondo-esque print for Angels with Filthy Souls, the fake film noir from the movie Home Alone, the collectible arthouse has come through with their own release from DKNG honoring the John Hughes penned, Chris Columbus directed modern holiday classic. This screen print only touts four colors, and that's incredible when you see just how gorgeous this piece looks. It shows off the iconic McCallister home (which actually exists in a suburb just outside of Chicago), complete with some fun easter eggs that fans of the film will recognize immediately. It's such an awesome piece of work. Look now! When approaching a concept for Home Alone, we knew the interior of the McCallister home and all of Kevin’s tricks to foil the Wet Bandits were likely to be the focus of our design. However, we also wanted to incorporate the exterior of the house and provide a different perspective on some of the movie’s most iconic scenes. We took some liberties with the architecture of the house and the layout of the property, but in the end the exterior allowed us to include some of our favorite imagery from 'Home Alone' including the Oh-Kay Plumbing van, the perpetually knocked over bronze statue, and off course, Old Man Marley. 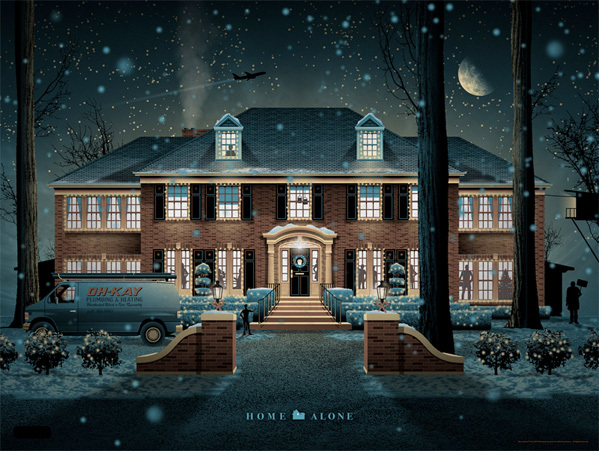 Home Alone is an 18×24 screen print with an edition of 275, and DKNG adds, "The poster is printed on a subtle metallic paper that will give the snow an extra shimmer as well." The print costs $40 and goes on sale at a random time Thursday, December 11th, so stay tuned to @MondoNews to find out when. Cool?